A post-apocalyptic world caused by magic is something that I haven’t seen before in YA. But Runebinder did it, and I’m glad. Magical fantasy elements with a modern-esque world is a pretty interesting concept. This book starts off with an action-packed scene narrated by the main character, Tenn. Tenn is an average character. I feel like he’s got the typical chosen-one syndrome going on. He’s just trying to survive in a terrible situation, but everyone else wants him to be a special snowflake. I do wish there had been more character development for Tenn. There was no opportunity for the reader to get to know him and his true personality; however, the same can be said of most of the characters. The relationships just happened super fast. This includes both romantic relationships and friendships. While the characters were just alright, the world-building for this story was fantastic. It’s such a unique concept. 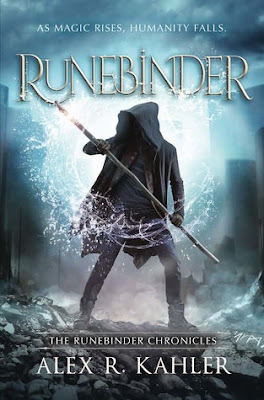 Runebinder mixes elemental magic with rune magic and demonic, zombielike creatures. It’s kind of like The Walking Dead mixed with Avatar: The Last Airbender. I think there could have been more explanation in the beginning for how the world and magic system worked, but I enjoyed learning what I could. All in all, this book is a great addition to the growing universe of YA fantasy stories. I would suggest going into it knowing that there’s a complicated magic system, though. I haven't read anything about this book before, but it sounds super interesting. I love a good fantasy and I love it when the world building is well written. It's a pretty good story. I think future books will be better than this one since the world is established now. This sounds really good even if there was some room for improvement with the characters.